As per the early demo versions of the maps, top half of the screen navigates the real world surroundings while the lower half of the screen shows maps. 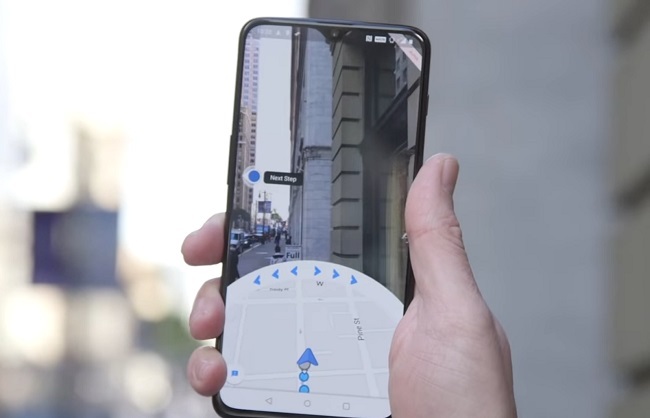 Google could introduce augmented reality (AR) technology in its Google Maps app to help the users navigate better with the app, particularly while exploring new places. Though it might still be work in progress, there is a sneak peek available on what possibilities exist and what all can be expected with the new technology using the camera fitted on the device. Google has already demonstrated what Maps app will look like and function in one of its events in 2018. There is an enhanced navigation system of the app that can popup visuals of landmarks close to the place one is visiting while using the Maps app and it will guide the user around. There is expected to be a news map as an add-on too. The screen will be split into two with one half, possibly the lower one, showing the map and the top half used for the visual demonstration of the area around the spot the user is navigating through. There would now be a blinking arrow for directing the user to take turns etc. The app has been put to real-life test by some journalists to see how it operates in different settings. While most of the features above could be experienced, the fox guide was missing the report says. Google plans to add digital guides to the app. There is a debate on if having the digital guide will be helpful or be a distraction and can be detrimental to the driver’s safety. A guide, going by the name Pizza Man was earlier seen on the maps app. But it is not very definite if Google will continue with it or remove it when these AR-based changes go live on the Maps app. It may still take some time before Google introduced these changes in the direction pointing app on mobiles.